Regions is offering a $400 LifeGreen Checking account bonus when you open an account by January 31, 2017, make 10 debit card purchases, and enroll in Online Statements through Online Banking. Updated 1/19/2017: This offer has been discontinued. If you have already registered for this offer and received a personalized voucher, you can still bring it to your nearest branch to open your Regions checking account before January 31, 2017. Then complete the additional requirements outlined on your voucher to earn your bonus. You can still participate in the Regions Bank Referral Program to earn a new personal or business checking account bonus. The $400 offer is valid for residents in Alabama, Arkansas, Florida, Georgia, Illinois, Indiana, Iowa, Kentucky, Louisiana, Mississippi, Missouri, North Carolina, South Carolina, Tennessee, and Texas. Check the state residency requirements for these promotions from Chase Bank and SunTrust Bank as well for more widely available offers. Updated 1/18/2017: Please note that there is also a $300 Bonus available that requires a direct deposit, but this new $400 Bonus was just provided by our reader Toby and it does not require a direct deposit, so it’s an even bigger and better offer. 1. Just open a new LifeGreen Checking account by January 31, 2017, using Promo Code 400MC3 online or by printing your voucher to present in-branch. 2. Make 10 check card purchases with your Regions Visa CheckCard within 60 days. 3. Enroll in Online Statements through Online Banking within 60 days. 4. Receive the $400 bonus credit to your Regions account within 120 days. 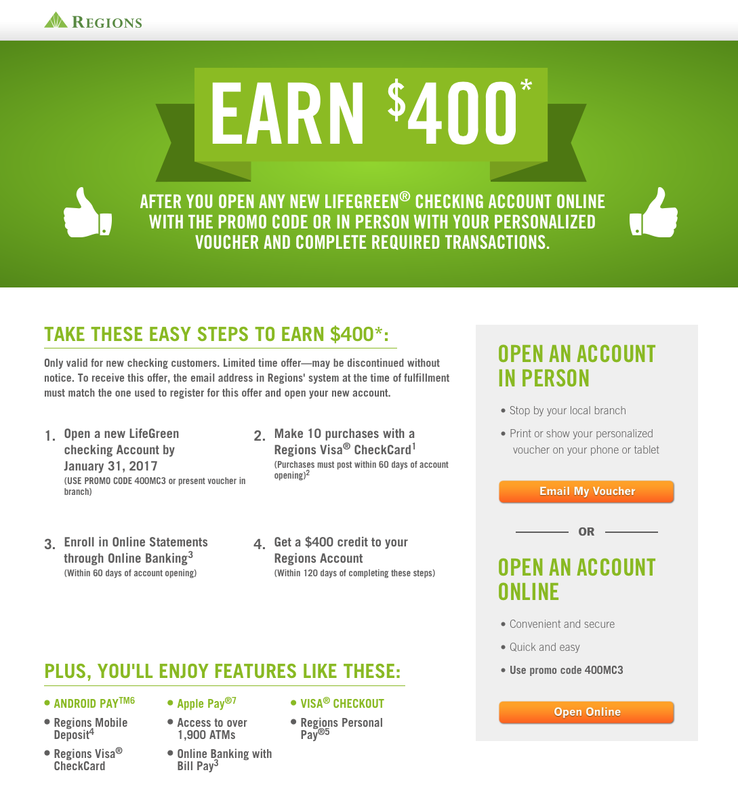 Apply online at this $400 Promotional Page to get your Regions $400 LifeGreen Checking Bonus. You must use the Regions Bank Promo Code 400MC3 when you open an account online. 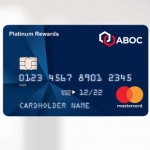 You can also request a voucher via email to open an account in person at your local branch, where you can either present your printed voucher or show it on your phone or tablet. The $400 bonus offer may not be combined with any other offer. It does not apply if you have or had a Regions checking account on or after August 1, 2016. This offer only applies to personal LifeGreen checking accounts. Regions associates are not eligible. All LifeGreen checking accounts require a $50 minimum opening deposit. A monthly fee may apply to your LifeGreen checking account, depending on account type, but this fee may be waived on some accounts if certain conditions are met. LifeGreen Checking Account: No monthly fee with $1,500 average monthly balance OR ACH direct deposit of $500 or more (or combined amount of $1,000). 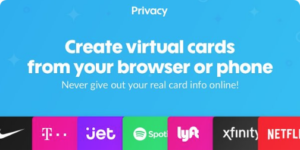 Otherwise, $8 monthly fee with online statements ($10 with paper statements). LifeGreen eAccess Account: No monthly fee with any combination of at least 10 check card and/or credit card purchases. Otherwise, $8 monthly fee with online statements ($10 with paper statements). LifeGreen Simple Checking Account: $5 monthly fee with online statements ($7 with paper statements). LifeGreen Preferred Checking Account: No monthly fee with $5,000 average monthly balance; OR $25,000 in combined balances; OR any first-lien home mortgage. Otherwise, $18 month fee. Sign up for Regions LifeGreen Checking to receive a $400 bonus today. A special thank you goes out to DepositAccounts and Doctor Of Credit for posting about the $300 offer and to our reader Toby for providing this new $400 offer link.